I was intending to have the raised floor of my living quarters lie on Box Van's floor without securing it. My thinking was, the weight of the living quarters structure would be sufficient. And mechanically securing the raised floor framing would be unnecessary. However, the persistence of two Readers has convinced me to change my mind! "I suspect you'll be hearing a "clunk" "clunk" noise as the floor joists bounce in the center when you're walking on them". "Your assumption (unless you have put a straightedge on the van floor) is that it is perfectly flat. If it is not, then you will have a hard time getting your sleepers to press down without rocking". Now I come to a part of Box Van's construction which is extremely exciting for me. And that exciting part is the assembling of the raised floor for my living quarters! After this assembly portion is complete, I must wait for the receipt of the Armstrong vinyl flooring from La Mesa Flooring. The vinyl flooring will cover the entire surface of the plywood top plate. Next comes the framing of the walls and ceiling! [VHB = Very High Bonding]. I used 3M VHB to secure the Yingli solar panel on Box Van's roof. 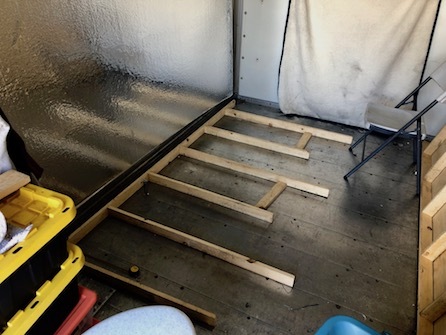 Now I am using 3M VHB tape to secure the raised floor frame to Box Van's aluminum deck. No screws. Just 3M VHB tape. I also plan to use the 3M VHB tape to secure these same floor joists to the 3/4" plywood floor cover. tape on these floor joists? I do not Blog much about my Son David anymore. However, David is always there for me. His soul lurking in the back of my mind. Bringing tears. Years ago, David purchased a pair of very high-quality scissors from a woman who lived in his neighborhood. Back then, it was popular for women to earn money giving "Block Parties" to demonstrate the use of whatever they were selling. Viviane Woodard Skin Care was one that you may remember. Anyway, I am using those scissors that David bought so many years ago to cut the 3M VHB tape. As I used those scissors, the thought popped into my brain that David himself held these scissors in his own hands. As the years go by, parents of children who have taken their own lives may find that they have very little to hang on to. And what is left keeps diminishing. Now I am holding a pair of fine quality scissors in my hands. That is what is left for me. Not fair! Lay them flat, glue them down with construction adhesive, cut 3/4" insulation to fit between them (spaced 24" OC) and glue the underlayment to the boards as well as the insulation. Don't cheap out on the quality of the underlayment plywood; any texture due to heavy grain will eventually show through the vinyl tile. This will give you a bounce=free floor with plenty of insulation. I've used that tape and other industrial grade adhesive tapes before for several things, but for unpainted wood....'dunno. 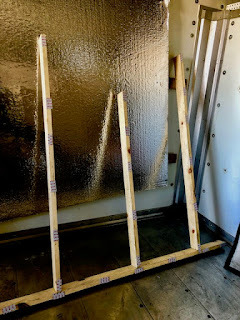 Still, for maximum bonding, ease and cost, I still recommend laying the 1x3's flat as true 'sleepers', glued liberally with construction adhesive (Liguid Nails or equiv in a caulk tube) and with equal thickness aluminized foam insulation board in between and plywood glued to all surfaces. This will provide maximum strength and quietness when you walk on it. A floor over hollow spaces will be noiser. 1x3s on edge won't conform as well to variations in the van's floor flatness, so bonding could be sketchier. As the tape releases a tiny bit at a time from on-edge joist movement, then dust moves in and the bond in that area is gone for good. Also for wall framing, remember that 1x3s on edge with about 1/2 sheathing loses almost 8" of interior width. Once you build out counters and furniture, that loss in the remaining center galley will become more evident and important. All these FWIW from my experience. George, please know that we , your long time followers remember that terrible time with you, including the trip to BART and many other very painful times, but we also remember the joy David brought you that you communicated with us in your blog. You are not alone. We love you ! It is with great thankfulness that I read your words. And, the memories that you have of those times moves me deeply! I think of David too especially where his ashes are scattered. I never forget. A pair of scissors is not the only thing left but its a small part...the bigger part is all the other memories i.e. kayaking down an Oregon river, building things around his house, etc. I often wonder if you still have his hat and leather bomber jacket. I'm 73 years old but I still have and wear my mother's ring. The ring was gifted to me from my younger sister on earning my Master's degree. I even remember her touch and how she'd squeeze my hand when I was a teenager. I picked that beautiful Santa Cruz place for David's scattering place. Only a few blocks from David's sibling, Johana. I do not know what became of David's bomber jacket. I bought an Indiana Jones hat [Same as David's]. But I do not know what became of David's actual hat. Memories. What wonderful things are our memories. Hi George.... I think of your David very, very often for many reasons: my own son is 49 and also named David, he is also a bachelor, he is also a professional working with computers. Many other uncanny similarities. Almost every time he and I communicate and before or after I read your blog, I think of your David and your loss. I cannot imagine the pain you feel. I agree his loss was unfair. On the positive side you have your blog with the details of your lives of many happy days. I wish I had kept a diary to read at times. While pictures help, your blog has your feelings as you expressed them at the time....priceless. Having rv'ed in California, and walked amid the giant redwoods, I imagine I would need to return at times and try to seek solace in the quiet and peacefullness that exists there. May you find the peace and comfort you so properly deserve. You are truly one of the most remarkable people I have ever known, yet never met. You have always been a champion of the perception of my online life! I cannot even imagine how you feel about your son's choice. You could put in a different colored board or something on your subfloor to remember David. Or write a poem on the underside of boards. Something that you know will always be there to pay tribute to David. It sounds like he was a good son. I do not fault David for what he did. His world was closing down around him! In the musical play based on Victor Hugo's "Les Meserables" are these words which shall haunt me forever. Because these words describe David's dilemma perfectly. "There are dreams that cannot be and there are storms we cannot weather". "....but even the darkest night will end and the sun will rise". I do not know where Hugo drew his inspiration for the quote you mentioned, but I have drawn great comfort from the last "almost remarkably implausible phrase" "...but even the darkest night will end and the sun will rise." Hugo lived in very turbulent times. He certainly knew darkness, yet waited with hope for the light. I found his sentiment in a much older source, the latter half of Psalm 30:5 ...weeping may endure for a night, but joy cometh in the morning. May God bless you, George. You are a friend to us. I am also a longtime reader. Way back to the mid 2000's. I also remember your blog posts about your trips to your son's house, the projects you did together and the love, kindness and support your son David showed to his foster children. I remember those dark times as well and the suffering you faced. I am sure it wasn't easy. The passage of time does not fix everything but it makes the days a little easier to face. I read your blog daily and follow your travels. Thru your eyes and adventures I have traveled all over the United States, Mexico, and place I could only dream of visiting. Wishing you many happy adventures!